It's official! 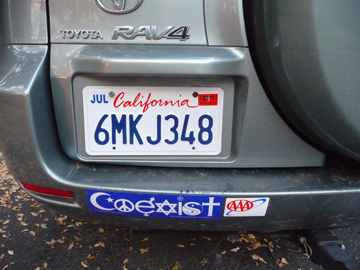 I am once again a full-fledged, registered-voter-driver-tax paying Californian. I fell in love with California when I was 22 and my husband, who had just returned from Vietnam, and I moved to Oceanside to finish his Marine Corps service. What a magical place ... palms that looked like giant pineapples, stick trees with red bows (coral trees), eucalyptus that sometimes smelled like a cold remedy and other times like a cat fight, fog and foghorns and, of course, the ocean, the mountains, the desert, the rivers and lakes. We had a tiny place on the river bottom and quickly found out that "it never rains in sunny California" was a bit of a lie. It flooded us twice that first year ... not that we cared a lot ... the furniture wasn't ours and all we had to do was carry out the ugliest, heaviest-when-wet braided rug in the world and sweep out the mud. The river bottom gave us endless paths for the daredevil dirt biking we did back then. Ahhh, youth! I still love California ... not only the diversity of its geography but the wide diversity of its peoples. Our diversity is often a challenge ... teachers, business owners and social services have to deal with a baffling array of languages and the political spectrum runs from the far right wackos to the far left nut cases. But, somehow it creates the most intriguing and stimulating stew and I am delighted to be back. Congratulations on finding home. . . officially. You sound light-hearted and open to California possibilities! Congratulations! It's good to be home, isn't it!